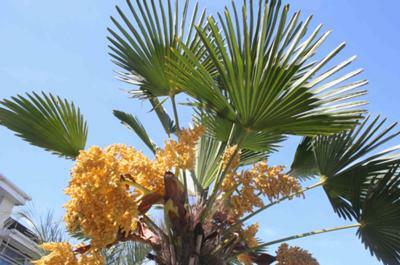 Hi, This is my trachycarpus wagianus in flower. It is just one of my many Mediterranean plants planted out during the summer of 2007. I got interested in exotic gardening after visiting the Eden project in September 2006. In the winter of 2006 I started to plan my garden for the next summer and ordered the majority of my plants. These were then delivered in May 2007. I have since continued to add to my collection. A few to name are Butia capitata, Butia eriospatha,a large Jubaea chilensis, Chamearops var cerifera and the green chamearops, various yuccas, dasalirions and succulents, and a large specimen olive tree.